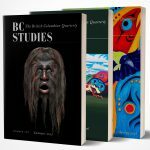 BC Studies is pleased to announce that Dr. David Rossiter will serve as the new Book and Film Review Editor. Dr. Rossiter is an Associate Professor in the Department of Environmental Studies at Western Washington University. He received his PhD in Geography from York University in Toronto, Canada in 2005. A broadly-trained cultural-historical geographer, Rossiter teaches courses on human geography, geographies of Canada, natural resource spaces, and post-colonial landscapes. His research focuses on contested lands and resources in British Columbia and the US Pacific Northwest. We look forward to working with David and welcome him to the BC Studies family.